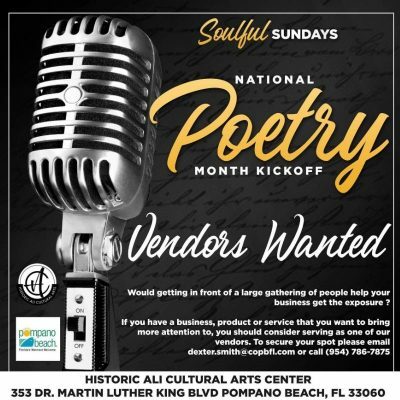 Soulful Sundays is a monthly event featuring South Florida’s top performers and bands in various genres ranging from Soul, R&B, Neo Soul, Blues to Jazz and Funk. Merging local and national artist, organizations and vendors, this program creates an unforgettable monthly musical experience that enriches as well as celebrates the history and culture of the African American community in Pompano Beach. This month’s event is open to seven vendors that sell merchandise and art. This is a first-come, first-serve opportunity. Please be advised, in order to receive a Vendor Application, you must send an email to dexter.smith@copbfl.com and include a detailed description of your business and products that will be on display. Vendor Application will not be sent until the detailed description is received. Vendors will receive an email confirmation of after required information is submitted. Within a few days prior to the event, you will receive another email with the location of your ‘space.’ Payments can be made Tuesday – Thursday from 10 am – 6 pm at the Historic Ali Cultural Arts or the day of event between 10:00 am and 3:00 pm. Vendors are responsible for setting up and covering the table, chairs will be provided. Limited availability for electricity. If using electricity, you must bring your own heavy duty extension cords and adapters. Pets are NOT permitted, except for service animals. Approved vendors will be assigned a designated space. Your space is not reserved until the form is approved. Please bring the approved form with you on the day of the event. Deadline to apply is Thursday, April 11, 2019 at 6 p.m.